Zookeeper quroum has odd no of machines . There are more than one master out of which only one is active. 1 Region Server(regionserver) can host multiple Regions(hregions) 1:m mapping. 1 Region(hregions) => multiple column family (Store). 1 store => 1 memstore , multiple Hfiles. 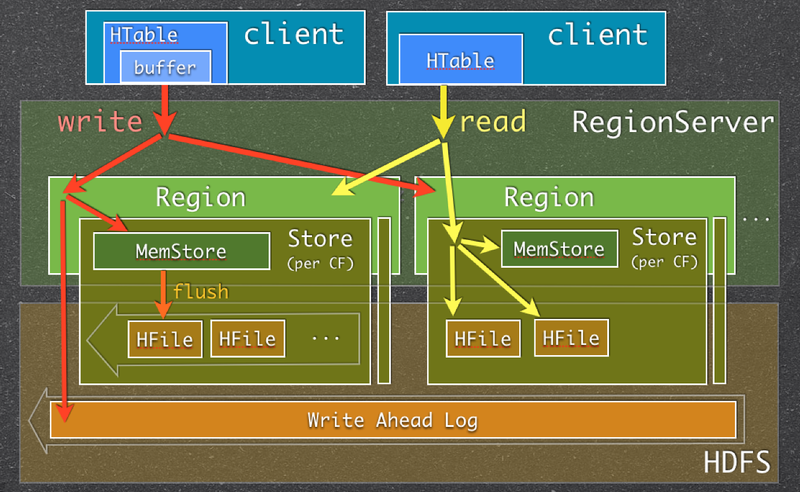 1 Regions => multiple memstore , multiple hfile . All Parameters for Hbase are intertwined . Changing one needs careful tuning of the other . Bottlenecks for Hbase is the associated storage HDFS as its a Disk read/write . to avoid full GC on RegionServer which can lead to complete halt. minor/major compaction (resulted from memstore flush ). frequent allocation of memstore and Block Cache may result in JVM heap fragmentation . The topic of flushes and compaction comes up frequently when using HBase. There are somewhat obscure configuration options around this, you hear terms like “write amplification”, and you might see scary messages about blocked writes in the logs until a flush has finished. Let’s step back for a minute and explore what HBase is actually doing. The configuration parameters will then make more sense. Unlike most traditional databases HBase stores its data in “Log Structured Merge” (LSM) Trees. Edits (Puts, etc) are collected and sorted in memory (using a skip list specifically). HBase calls this the “memstore“. When the memstore reached a certain size (hbase.hregion.memstore.flush.size) it is written (or flushed) to disk as a new “HFile“. There is one memstore per region and column family. From a correctness perspective that is all that is needed… But note that HBase would need to consider every memstore image ever written for sorting. Obviously that won’t work. Each file needs to be seeked and read in order to find the next key in the sort. Hence eventually some of the HFiles need to be cleaned up and/or combined: compactions. A compaction asynchronously reads two or more existing HFiles and rewrites the data into asingle new HFile. The source HFiles are then deleted. This can be tweaked to optimize either reads or writes. If you let HBase accumulate many HFiles without compacting them, you’ll achieve better write performance (the data is rewritten less frequently). If on the other hand you instruct HBase to compact many HFiles sooner you’ll have better read performance, but now the same data is read and rewritten more often. HBase allows to tweak when to start compacting HFiles and what is considered the maximum limit of HFiles to ensure acceptable read performance. Generally flushes and compaction can commence in parallel. A scenario of particular interest is when clients write to HBase faster than the IO (disk and network) can absorb, i.e. faster than compactions can reduce the number of HFiles – manifested in an ever larger number of HFiles, eventually reaching the specified limit. When this happens the memstores can continue to buffer the incoming data, but they cannot grow indefinitely – RAM is limited. What should HBase do in this case? What can it do? The only option is to disallow writes, and that is exactly what HBase does. The size a single memstore is allowed to reach before it is flushed to disk. A memstore is temporarily allowed to grow to the maximum size times this factor. JVM global limit on aggregate memstore size before some of the memstore are force-flushed (in % of the heap). When a store (region and column family) has reach this many HFiles, HBase will start compacting HFiles. HBase disallows further flushes until compactions have reduced the number of HFiles at least to this value. That means that now the memstores need to buffer all writes and hence eventually are subject blocking clients if compactions cannot keep up. The maximum number of HFiles a single – minor – compaction will consider. hbase.hregion.majorcompactionTime interval between timed – major – compactions. HBase will trigger a compaction with this frequency even when no changes occurred. Maximum time clients are blocked. After this time writes will be allowed again. writes are blocked for hbase.hstore.blockingWaitTime milliseconds. Note that this is not a flaw of HBase but simply physics. When disks/network are too slow at some point clients needs to slowed down. keep hbase.regionserver.hlog.blocksize * hbase.regionserver.maxlogs just a bit above hbase.regionserver.global.memstore.lowerLimit * HBASE_HEAPSIZE.